NOT FAR FROM my office in Southwark is a small shop in Borough Market that sells nothing but English wine. It’s smaller than my bedroom, has bottles stacked to the ceiling and looks like it would be downright uncomfortable working there in the winter given opens like a garage-door onto the street. But the Wine Pantry seems to be doing something right. In the short time I was there, people were out front sipping from glasses in the sun and there was no shortage of people popping in looking for something new to try. A decade ago, or even five years ago now I think about it, this would have been a laughable business model. Just imagine how the conversation might have gone with a bank manager back then, when English wine was mostly a curiosity except for a few Champagne-beating sparklers. A shop selling just English wine? When there’s a wine lake in France overflowing our shores already? Much has changed in the English wine market lately. The quality is now becoming exceptional, and that’s not just the fizz. Also, it seems enthusiasts are willing to pay the higher prices this wine commands now it’s of a high enough calibre, whereas in the past anything other than the fizz was often of touch-and-go drinkability. My introduction to the Wine Pantry was one of mild embarrassment where I was put on the spot by my good friends. Knowing I blog about wine here, on www.12×75.com and also at Ella Mag, they thought it absurd I’d never stopped in previously. And they’re right; I’ve procrastinated ever since the shop opened. 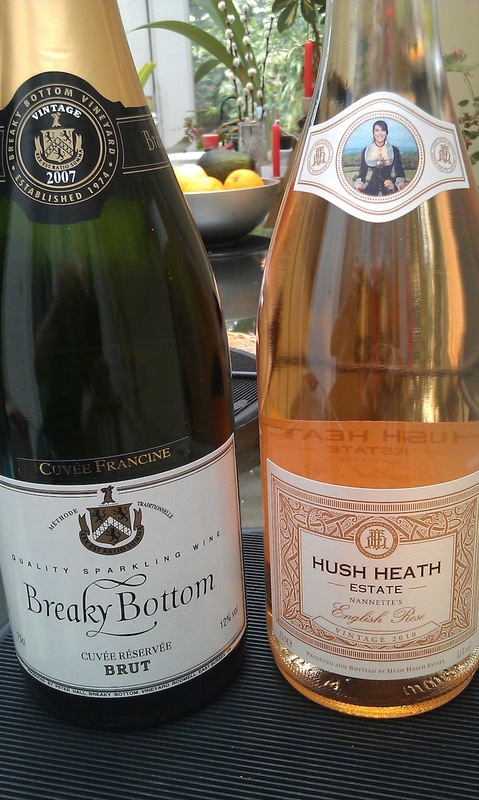 Knowing I was a wine blogger, the two women in the shop were quick to give me samples of every manner of wine they had in stock, ranging from sparklers I’d lusted after for some time (after all these years I finally got to try Break Bottom) to still whites, rosés and reds that no one will ever see in a supermarket. Will I be back again? Definitely. I fear I’ve fallen madly in love with this place. For every wine I tried, there were four or five more to sample on my next visit. That evening I walked away with two wines from Wine Pantry, one of which was a gift from a friend and the other a gift to myself. The gift from my friend was a Hush Heath Estate Nannette’s Rosé 2010, made from the second pressing of the estate’s sparkling rosé. Nannette’s is a delicate rosé that is pale in colour and has just a hint of a strawberry aroma, as all good pink wines should. This is certainly no fruity imposter. It’s more mineral and grassy in flavour, with low alcohol that is perfect for sunny days in the garden with perhaps some seafood to keep it company. I was reminded of proper Provençal rosé, with its pale, almost salmon pink colour, and complex palate. Switching gears slightly, the gift I bought for myself was the Breaky Bottom Cuvée Francine 2007 sparkling wine. Made from the standard three Champagne grapes – chardonnay, pinot noir and pino meunier – as well as the estate’s somewhat quirky use of seyval blanc, this is still a bit young and needs time in bottle to develop more of those Champenois flavours that are hanging around in the background. My beef with most English sparkling wine is it is released to the market far too early, a long time before their complex flavours have truly come to the fore. Another year or two in bottle can’t hurt almost any of the fizz coming from these shores and the same can be said of this one from Breaky Bottom. If I drink it before the year is out, it will be because I had a moment of weakness.